We are approaching many limits to growth over the next several decades, and are consequently facing many challenges in our immediate future. Finance, energy, environment, resources and climate will all impact on the single-minded, one-dimensional trajectory human society has been on in our era of growth imperative. Our current path is unsustainable. It cannot and will not continue, so we must adapt our societies in order to build a new future. The first challenges are being presented by the on-going global financial crisis, which is far closer to its beginning than it end, and by the geopolitics of energy. Events in Europe, particularly in Cyprus, Detroit and latterly the Ukraine, represent a major wake up call that financial crisis is about to resume in earnest and that energy issues are moving towards criticality in many places. We must anticipate and navigate a period of rapid economic contraction and increasing risk of resource conflict, punctuated by the emergence of geopolitical wildcards. Nicole Foss will explore the links between the converging pressures facing us – economic contraction, peak energy and geopolitical stress. 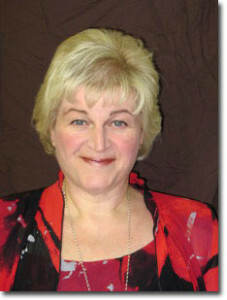 She will outline her latest thoughts on the implications for our everyday lives and share practical solutions she has observed recently from around the world. 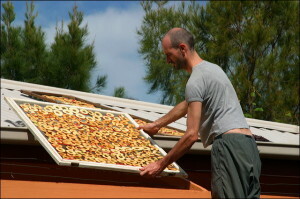 Drawing from 30 years of permaculture teaching, designing and demonstrating rural and urban agriculture food production systems for sustainable living, Transition activism and personal example, David Holmgren will outline practical strategies to help households and communities survive, thrive and contribute to a better world. Permaculture co-founder and the author of Future Scenarios, David Holmgren toured the country with Richard Heinberg in 2006 informing the public of the threats of imminent peak oil and the permaculture responses. Eight years on, more people have installed insulation and solar, started growing food, raising chooks, and buying from local producers. Also eight years on, the peak of conventional oil is already in the rear view mirror and the first stage of the second Great Depression is pulling apart economies and nations around the world. The mining boom has allowed Australia to dodge the worst, but the signs are not good. Government plans for austerity highlight the need for households and communities to increase their self reliance. 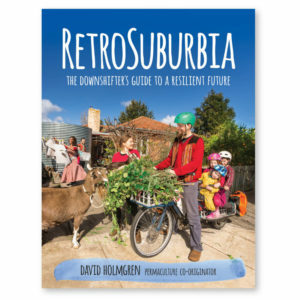 David’s updated presentation uses permaculture design principles to interpret the signs and show how getting out of debt, downsizing and rebooting our dormant household and community non-monetary economies are the best hedges that ordinary citizens can make. The idea that these household and community economies could achieve unprecedented growth rates if the monetary economy takes a serious dive is a good news story you won’t hear from mainstream media. The shift of metaphor from ‘retrofitting’ to ‘surfing’ suggests a stronger role for positive risk taking behaviour change without the need for expensive changes to the built environment that few will be able to afford. Returning to Aussie St, David shows how the permaculture makeover and behaviour change is progressing through the Second Great Depression. Aussie St is not only surviving but thriving through the “dumpers” that property bubble collapse, climate chaos and geopolitical energy shocks have unleashed on the lucky country. An endearing, amusing and gutsy story of hope for in-situ adaptation by the majority of Australians living in our towns and suburbs. On this tour David Holmgren is joined by Nicole Foss, leading system analyst, who explains how the deflationary dynamics that always follow finance and property bubbles, will rapidly impact individuals, families and communities, while the longer acting forces of Peak Oil and Climate Change will determine and limit the nature of any economic recovery. Nicole will paint a comprehensive picture of where we stand today globally, how our human operating system functions, how and why it is acutely vulnerable, and what we must do about the predicament in which we find ourselves. The focus will be financial, social, and geopolitical, reflecting the priority of impacts likely to be felt in the relatively short term. The critical factors for change will be highlighted, with an outline of the possibilities that exist within the scope of the emerging reality. We must plan to restructure our societies from the bottom up, so that both the transition period and our eventually recovery from the coming upheaval, can rest on a solid foundation. That foundation requires the resurgence of resilient communities and the development of true human capacity. Her succinct and riveting presentation sets the scene for the positive permaculture strategies. More than just an affirmation of what many are already doing, Foss’s systemic perspective is a wake up call for those concerned about environmental and social issues to understand how their own exposure to financial collapse will determine whether they can shape a better future for themselves, their children and their communities. The two will inform Australians how it’s possible, although not inevitable, to weather the coming storms with grace, rebuild community solidarity and provide a bulwark against the worst expressions of fear, blame and xenophobia, that naturally arise in times of hardship. 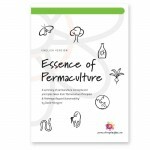 Most importantly, it will highlight how a small but significant minority following a path of enlightened self interest, and informed by permaculture design principles, may have a more powerful and positive influence than mass movements demanding their rights from weak and ineffective governments. Humanity stands on the edge of a precipice, and where we go from here is in our own hands. There is both considerable danger, and the opportunity to address constructively what is arguably the most challenging situation in human history. Due to the public demand, one extra tour date is added. We offer Melliodra tours, both solar house tour in the morning and farm garden tour in the afternoon on Saturday May 3. Please go to the online shop to make your booking. This will be the last tour until September. As the air cools down, the Melliodora open house and garden tours will come to a close. We will have a break during the cooler months before we open our sustainable house and abundant property once again in September. There are still two more tours where you can see Melliodora with an autumnal aura. 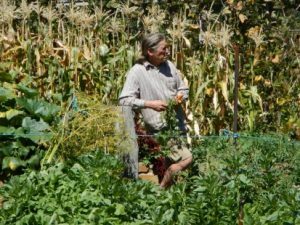 Permaculture cofounder David Holmgren will lead you through the house and the garden farm he designed, built and maintains with his partner Su Dennett. When it is getting cooler outside, inside the house the temperature remains comfortable without any energy input. Would you like to find out how it can be done? The easiest way is to see a working model, like the one at Melliodora. Come to the sustainable house tour during the morning and find out for yourself. You will also discover how life is possible without weekly trips to the supermarket. How to minimise your ecological footprint and go locavore, build a more resilient household economy, and much more. Throughout the morning tour, David and Su will show you the strategies and tactics they employ to these ends and other ideas that can be applied in your home. In the afternoon David will take you around the garden farm system. What are some of the key strategies to employ to maximise the yield from your garden? How can you incorporate animals in your garden? How can you design the famed “food forest”? Your hosts will show examples as well as explain the guiding principles which you can take home and adapt to your own conditions. Tour participants will be treated to yummy morning and afternoon teas, prepared by Su, using mostly local ingredients. Also on the day, our extensive catalogue of hard-to-get-hold-of books and other resources, will be on sale at special prices. No need to remind you now perhaps, but the May 4 tours will be the last opportunity to see Melliodora’s house and garden until September. Do not miss out on this opportunity. See more details including the address on our Events page. Book early so that you don’t miss out. To give you a taste, here’s the photos and account from one happy tour participant in our March tours (Photos in this post are from the Permacultured website. Thanks Tatyana). Coming to visit Melliodora is an eye opening experience. 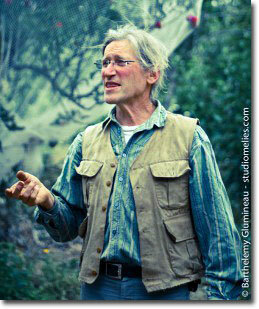 If you want to see permaculture in action, this demonstration site is the place for you. See how the well designed house stays cool in the middle of a hot summer. When we had to cancel the tours in February, because of the heatwave conditions and high fire danger, the afternoon temperature outside soared to over 40 degrees. Outside it was unbearable, even in the shade. But inside the house, the temperature was slightly warmer than usual, a relatively cool 28. Would you like to find out how it can be done? The easiest way is to see a working model, like the one at Melliodora. Come to the morning tour guided by David Holmgren and experience the unassisted coolth of the house When it’s cold the same principles create a passively warm house. Ever thought about life without trips to the supermarket? Dreamed about minimising your ecological footprint and going locavore, building a more resilient household economy? Throughout the morning tour, David and his partner, Su Dennett can show you the strategies and tactics they employ to these ends and other ideas that can be achieved in your home. 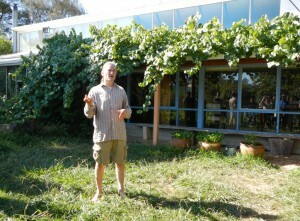 In the afternoon tour (fingers crossed that it won’t be too hot), David will take you around their garden farm system. What are some of the key strategies to employ to maximise the yield from your garden? How can you incorporate animals in your garden? How can you design the famed “food forest”? Your hosts will show examples as well as explain the guiding principles which you can take home and adapt to your own conditions. Tour participants will be treated to yummy morning and afternoon teas, prepared by Su. Also on the day, our extensive catalogue of hard-to-get-hold-of books and other resources, will be on sale at special prices. Remember, the tours in March will be the third last opportunity to see Melliodora house and garden, before the end of the season. Do not miss out on this opportunity. The March Melliodora tours are on March 2. See more details including the address on our Events page. Book early so that you don’t miss out. Anyone said ‘bloody hot isn’t it’ lately? When heatwaves sweep across Australia with the temperature climbing above forty degrees outside, we feel so fortunate to be working inside a well designed house where the temperature stays around 25. Without air-con, of course. You don’t have to be a rocket scientist to appreciate and understand the principles behind the well designed passive solar house. Why don’t you join us inside the Melliodora house for the tour on Feb 2 to feel for yourself, and to learn the principles, so that you too can have a cool house in summer (which is also warm in winter)? During the morning, your hosts, permaculture co-founder David Holmgren and his partner Su Dennett will show you how it can be done. Not just a cool house, they will show you the way the house operates and functions to support the home-based lifestyle and economy. You will see the design principles as well as practical applications at work, including the cool cupboard and simple compost toilet. Ask them about cooking and preserving too. If you are interested in resilient local and household economies, they will show you how it really works. If you are interested in fermented food, they will tell you how they make their own yoghurt, miso and other fermented food. Interested locavour diet and foraging? They can show you how. Concerned about the bushfire threat? They will explain how to make the house less vulnerable against devastating fire. And in the afternoon, on the second tour, the garden tour, David will take you around the Melliodora garden farm system from which most of their food comes. You will see the garden bearing abundant fruits and vegetables, while the chooks and goats do their stuff. What better place to see, feel, touch and experience all aspects of permaculture at work than the world renowned Melliodora? Join us on Feb 2 on the Melliodora tours. See more details in the Events. For booking, simply go to our online shop. You too can stay cool, if you design right. On Sept 1, the Melliodora resumes its popular monthly guided tours which continue through the warmer seasons. There is no better way to learn how household economy works, and garden and land are maintained and managed sustainably, than to take part in the two and half an hour tours at Melliodora, one of the world’s best examples of permaculture principles application. 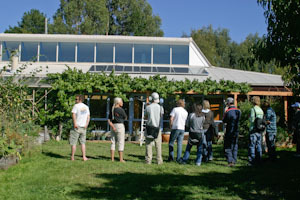 We run the “Solar house tour” in the morning and the “Garden farm tour” in the afternoon. You can take part in just one, or attend both on the same day. This season, we have decided to include the Melliodora eBook on CD ($35) which is a record of the first 20 years of development of the site, in the tour price. The eBook details how the Melliodora you see was designed and established, explaining how some of the design decisions were made, some specific techniques applied, why and how some of the plants were planted where they are, and so on. We believe this addition will enhance your experience at Melliodora long after you visit here. An ideal refresher of your visit here. We have also introduced the new tour booking system. All you do to make bookings for the Melliodora tours, is go to our online shop and purchase the product called “Melliodora tours“. There should be enough add on options to meet all different types of requests, but if you are stuck, drop us a line. We want to make it work. If it doesn’t work for your particular group, we can always go back to good old pen and paper. It should be all clear if you read the Product Description carefully first. The tours are extremely popular, but the places are strictly capped, so please make your bookings as soon as possible. We are planning to bring in our third guided tour around Melliodora, tentatively called the “Beyond gardens tour”. Details will be announced soon, so watch this space! You may be also interested in our residential Spring seasonal cycle course in October.